In honor of American Archives Month, the University Archives & Historical Collections is holding a photo contest. Learn about MSU history and see how campus has changed by creating Then-and-Now photos and possibly win a prize! Overlay a historic MSU photo from the MSU Archives over a current setting to show the past and present in the same photo. 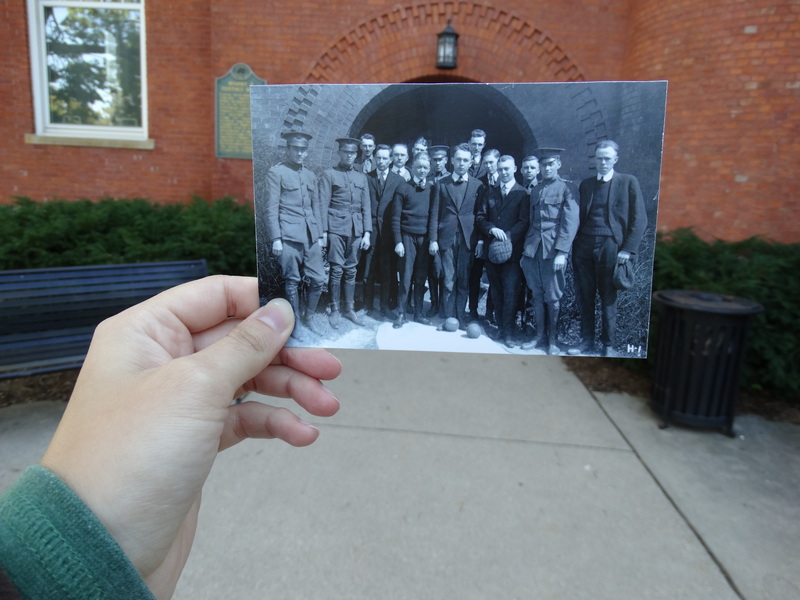 Create a side-by-side image using a historic MSU photo from the MSU Archives next to the current setting. * Submit photos through the MSU Archives’ email at archives@msu.edu. Please include your name, address, and descriptive title for your photo(s). * Entries will be accepted through October 31, 2014. Horticulture students pose for a picture in front of Eustace-Cole Hall in 1918 overlaid on Eustace-Cole Hall as it appears today. Army Air Force trainees enter Abbot Hall in 1943 and photo of Abbot Hall as it appears today. Entry Period: 8:00 a.m. October 1, 2014 to 5:00 p.m. October 31, 2014. Eligibility: The contest is open to MSU faculty, staff and students, MSU alumni, and the greater Lansing community. Entries: Submit photos through the MSU Archives’ email at archives@msu.edu. Please include your name, local address, and descriptive title for your photo(s). Prizes: The top three winners will receive a mug with historic MSU images. Judging: Entries will be judged according to originality, creativity, communication of the contest theme, and overall appeal. Winners will be chosen by a panel of experts the first week of November. Sorry that we are a little late getting out the answers to the trivia contest this year. It has been very busy at the archives, which is a very good thing! We want to thank everyone for participating in the 2011 American Archives Month Trivia Contest. Over 40 people entered and three people answered all questions correctly. The staff at the University Archives & Historical Collections would like to thank everyone for playing and we hope that you all participate in our contest next year. 1. Which MAC alum entered college at the age of 15 without a high school diploma? This alum would later become a leading figure in scientific research at the White House and serve on a commission that was a precursor of the Manhattan Project. 2. While waiting for Snyder and Phillips Halls to open, a housing crunch in 1946 forced nearly 500 male students to live where on campus? 3. In 1949, MSC Shadows replaced which popular song as our alma mater? 4. Which Hollywood beauty joined MSU halfback Billy Wells for a dream date at a pregame Rose Bowl dinner in December 1953? 5. In what year did the MAC Aggies first claim a football victory over the University of Michigan Wolverines? 6. Who was head of athletics when MAC (now MSU) dropped out of the MIAA (Michigan Intercollegiate Athletic Association)? Please Note: There was a typing error on the printed version of this form for Question 7. In the interest of fairness, this question was not counted for or against any person who played the trivia contest. 7. When Michigan Agricultural College opened in 1857, how many on-site faculty/staff members were employed by the college? 8. Which of the following campus traditions was no longer in effect after 1935?